38% say it’s hard to plan consistent content that hits their goals. 22% can’t find the time to create content. 16% find it tough to create awesome content. That got me thinking: How can you save time while planning awesome content, really? And what if there were real stats, facts, and examples to help you out with tons of advice, so you can pick the best techniques that work for you? Dedicating time to plan awesome content in the first place helps you create that content quicker (and it’ll be a lot more effective, too). Takeaway: Set aside time each day to improve what you’re already doing. While Abe liked to spend 67% of his time planning, some, like me, find the trusty 80/20 rule perfect for this: Spend about 80% of your time executing while dedicating at least 20% to planning. Use that time to set awesome goals. Awesome content is a result of awesome marketing goals. If you don’t have a way to measure your success, there’s no way to understand if your content really was awesome or not. I’m a big fan of SMART goals: specific, measurable, accurate, realistic, and time sensitive. Your goals will help you choose the best projects to tackle based on what will have the biggest impact on how you’ll measure success. Takeaway: Define no more than three SMART goals for your entire content strategy (taking on too much can spread your resources too thin). Try a format like this: Grow [goal name] to [# of growth] by [date] to [reason why it’s a priority]. Figure out how you’ll hit your goals. This is where audience + topics + ideas = content. For example, Jess Ostroff and the team at Convince and Convert plan topics they know their audience will love right on their editorial calendar in CoSchedule to help them focus their awesome Definitive emails. Takeaway: Survey your subscribers to understand their favorite topics, content types, and challenges to plan your blog and marketing. That’s exactly what we did at CoSchedule, and why you’re reading this post right now. Explore the best content types. Take your understanding of your audience and test all sorts of content—blog posts, e-books, landing pages, video, etc.—to understand which content types have the greatest impact on your success. Content is data. Setting out to create only one content format without the understanding of what could perform even better is a missed opportunity. Content marketing is more than writing blogs. Way more. Takeaway: Publishing consistent content definitely helps build a loyal audience of returning readers. What works best for some, like blogging, may not work best for you. Explore different content types and consider your blog a marketing hub instead—a place where you can publish and share all sorts of content, then measure the data to understand what works best for your business and audience. Your survey data tells you how to connect with your audience the best way possible. Brainstorm how you can connect their needs with your content to help you reach your goals. Takeaway: Go through your entire list of projects and rank them in a way that makes sense to you, like Marcus ranked his priority projects as ones, while the least important were threes. Understand how every piece you’ll publish contributes. This is when you understand the purpose of everything you’re publishing—what the content will look like and its outcome on your goals. Think of this as a creative brief—the direction you need to share with your content producers to help you get a solid piece right off the bat, while avoiding tons of editing once you get the first draft. At CoSchedule, we’ve been able to speed up our editing process by an average of two and a half hours depending on the post, just by providing more direction to our guest authors before they begin writing. Takeaway: Begin your projects with outlines, write fast, and return later for edits. Define the call to action before you write to avoid over-editing later. Schedule your content consistently with your CoSchedule marketing calendar. Add your prioritized list of content to create right into your marketing calendar in CoSchedule to define deadlines and workflows for everything. Jess at Convince & Convert saves about 20–30 minutes per piece they publish because they use CoSchedule as a marketing calendar. Takeaway: Schedule your content with clear publish dates on your CoSchedule calendar. From there, assign custom workflows for each project, or even use task templates to create reusable workflows for repeating projects like blog posts. Takeaway: Give yourself time when you traditionally find it difficult to concentrate (maybe Friday afternoons when it’s hard to write new material) to review your CoSchedule calendar for the following week. Schedule your blog to automatically publish, and send social messages to save even more time. Use tools designed for the job. At CoSchedule, we host our weekly #CoChat Twitter chat on Thursdays and publish a recap post on Friday afternoons. We had been collecting the tweets manually, which took forever, so we switched to using Storify to cut the time from one and a half hours per post to less than 20 minutes. Tools designed specifically for your use case, like CoSchedule for your marketing calendar, can save you tons of time because they eliminate inefficient manual work from your content creation process. Takeaway: Time is money. How much is time worth to you? 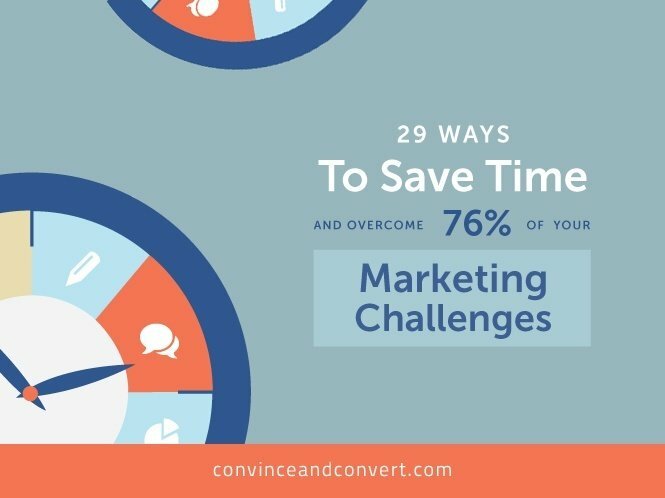 Using marketing tools designed to do what you want them to (instead of using generic programs already on your computer) can help you save time while increasing your productivity. Turn your publishing on autopilot. Research the marketing tools that help you pre-schedule your content to publish. Check out CoSchedule to schedule your blog posts and social media shares way before you publish to save 30 minutes per post or more. Email, video, opt-in forms, and landing pages (among tons of other content) can be set on a schedule to either publish or remove itself, which saves you from inefficient manual work. Don’t overdo it, though. Use open rates, data, and responses from your audience to gauge how much automation is too much. Be careful with auto direct messages on Twitter, auto-follows, and auto replies. Takeaway: Look for tools that help you schedule content to publish when you need it to. That way, you can review your content one final time and schedule your content to publish itself automatically. Sean Jackson from Copyblogger wrote a post about how SEO is dead, and it’s all about optimizing content for discovery and conversion (OC/DC). While search engine optimization isn’t really dead, his advice helps you focus on creating compelling content and distributing it effectively to your audience. You probably already email your subscribers and share content with your social media followers. Optimizing your content for discovery and conversion is how you make your time totally worth it, so new audiences and searchers can find it long after you publish and share it with your initial launch campaigns. An SEO content strategy like this helped us increase our #1–3 search results by 248% in six months. Takeaway: Target keywords, focus on internal linking structure, provide downloads in exchange for email addresses, and distribute your content to build your audience. Let your data tell you what to do. You’re like us at CoSchedule and set goals to prioritize your content based on what will give you 10x growth. Whether your projects are successful or complete flops, your data will tell you if it’s worth your time to continue doing certain projects based on their contribution toward your goals. The social analytics tool in CoSchedule helps you understand how successful your blog posts are and helps you share your content again to reach a broader audience. Similarly, if there are tasks and projects you complete every week just because it’s always been that way, it’s time to re-evaluate. Everything you do must impact your goals, or it’s wasting your time. Repeating what you know is successful helps you use your time super-efficiently. Takeaway: Repeat the elements from your most successful projects to form hybrid content. Analyze your current list of projects to remove items that don’t have dramatic impact on your goals. I just read a post about time-saving tips when you’re at home. The article suggests having separate baskets for your dark, light, and colored clothing so you don’t waste time doing it yourself later on—you can just take a basket and throw a load in the laundry machine. Apply that theory to your content: Group similar projects together to knock them out as sprints. Now you can focus your energy completely on related projects to really get in the zone and crank up that productivity. Takeaway: Use an agile process to tackle similar projects together during the week. Focus on completing your projects, so you don’t have multiple open at any given time. Stack your weekly pill box. My grandma has a pill container she fills once a week, putting all of her pills in daily compartments. This way, she never misses a pill and doesn’t waste time looking for her pills every day. Think of your projects this way: How much time do you have in a given week, and how many projects can you realistically take on every day? Planning your time accordingly will help you stay sane, while reviewing your project lists once a week can help you nail down the details before diving in. Takeaway: Save time by planning your weekly projects in advance. Use your CoSchedule marketing calendar to focus your time, know exactly what’s coming up, and knock out the weekly plan before you stall on any projects. Create content when you are most productive. As Seth Godin drills into your head when you read Linchpin, you are an artist. Artists are more creative at different times and in different places—it’s up to you to figure out when and where. James Clear explains that he writes best in the mornings, so he saves time by prioritizing writing for the best part of the day when he is productive. Maybe that’s you, too. Or maybe you’re like Jonathan Long who knocks out non-glamorous tasks first, so you don’t put them off. Takeaway: Take an introspective break to understand when you’re at your best. Plan your day according to your personal productivity and creativity timeline. Plan your day like a physical therapist. My buddy Roy is a physical therapist who needs to account for billable hours because of Medicare and Medicaid. It gets nerdy fast, but he literally has every minute of his day planned before he gets into work so he knows exactly how he’ll spend his hours to bill his time. I started doing this for my own workdays a year ago and found that I underestimate how much time I spend writing, which helps me focus on improving my writing speed. Similarly, Leo Babauta suggests planning a 6-hour day and analyzing where you spend your time to improve your productivity. Take breaks to increase your productivity. Taking breaks means you’re not doing anything… right? Well, a study in the Journal of Occupational and Organizational Psychology found that participants who were given a 20-minute break for progressive relaxation actually boosted their productivity when they returned to work. Sometimes, you may need to step away from writing that post, creating that e-book, or editing that video to actually spend your time more productively when you get back. Takeaway: Coffee breaks, lunches, meditation, or walks are all great ways to recharge and come back to creating even better content. A Stanford study shows multitasking actually lowers your IQ. Yikes. And the American Psychological Foundation found data that says the more complex your tasks become, the more time you lose when you switch back and forth. Takeaway: Shut off the Internet when you create content. Don’t check social media, email, or instant messaging. A mentor of mine once said you lose 15 minutes every time you’re interrupted—find somewhere to work that is free of distractions. At CoSchedule, our team has a pretty wide range of talents. Sometimes, it’s easy to see who will be able to rock a project faster than someone else. We save time by addressing road blocks in a daily meeting called scrum, which serves as a way to ask for help and learn to get faster and more efficient. Takeaway: If you’re stuck, you’re wasting time. Ask for help to avoid muddling through, so you can move faster. If you’re marketing solo, that could involve research (and could very well be why you’re reading this post!). Agile project management works really well because there are clearly defined rules the entire team understands. Since this process helps you plan the projects you’ll complete, it also gives you the permission to say no to changes, more tasks, and even new projects. Takeaways: Explore agile marketing project management processes to increase your productivity. When someone asks you to complete a project, say no to immediate “fire drill” tasks, and add them to your list of future sprints. Explore new processes to increase your productivity. What you’re doing now may work just fine. But if you don’t continue to explore, you may be missing out on opportunities for additional growth. Adding new tools and project management techniques into your content creation process save time while increasing your efficiency. Also, growth hacks specifically help you get the most out of every piece of content you publish by focusing on the details to grow awareness and get more traffic, subscribers, and conversions. Takeaway: Look at your current processes from an outsider’s perspective. What is confusing, manual, and inefficient? Where are you missing opportunities to grow awareness and convert your marketing target audience into email subscribers and customers? Those are areas you can improve immediately to increase your efficiency. Republish, repurpose, and reinvent your content. You’re reading this post right now because we surveyed our audience at CoSchedule, wrote a post about it, held a webinar on it, and found all of that to be super successful. We know you need to learn how to save time while planning awesome content, so various tips, tactics, and techniques are right up your alley—and sharing that content through different formats (posts, webinars, videos, infographics, and templates) helps us reach a larger audience. Republish by syndicating or giving other blogs permission to copy and paste your content. Repurpose by turning it into new content formats (for example, blog posts as chapters in an e-book). Reinvent your content, like I’m doing with this post, by using an idea that works and building on it. Takeaway: Different content types reach different learning styles. Republishing shares your message with new audiences you may not have had access to from your own blog or content hub. Use the time you put into content creation effectively with republishing, repurposing, and reinventing as part of your project from the get-go. Keep an ongoing content ideas list. Inspiration hits whenever and wherever. Don’t take the time you spend generating content ideas for granted—be prepared with ways to capture every thought, even if you don’t have an Internet connection. Takeaway: Use Evernote to capture your content ideas on the go. Connect your notebooks right into CoSchedule to simply drag and drop your ideas as content on your calendar. You can even use your drafts bin in CoSchedule to store your blog post ideas. Keep a calendar of record to send 75% fewer emails. When Arienne Holland and her team needed to increase their productivity, they looked to CoSchedule for a simple, task-based workflow. That helped them send 75% fewer emails and kept project communication in one place—their marketing calendar. Imagine no more copying everyone involved in a project on emails, but rather, focusing on flexible workflows that increase accountability, communication, and productivity. Takeaway: Figure out a way to eliminate the amount of emails you send per project by consolidating communication in a marketing project management software designed to increase your productivity. We recently analyzed more than one million headlines to understand how emotional value impacted their success on social media. The results: More emotional headlines performed the best. Emotional headlines help your audience connect with your content. Use the CoSchedule headline analyzer to write better headlines. Takeaway: Write at least 25 headlines using the headline analyzer from CoSchedule. Choose the best ones, and A/B test them using Twitter. Check out your engagement, and change the headline to the winner to get the most traffic and shares from your hard work. Brian Dean from Backlinko researched his topics, wrote more robust content on those topics than anyone else, and asked for links to increase his search traffic by 110% in 14 days. Crazy? Not really. Even if other content was good, Brian researched the heck out of those topics to publish better content than he could find anywhere else. By better, I mean more detailed content, complete with in-depth graphics and embedded media covering topics highly likely to be shared by your audience. Takeaway: Learn all the details on why the skyscraper technique really works for improving your content marketing. Research your competition for your keyword, write better content than anything you can find, and ask credible sources to link back and share your content. Hook your readers with long-form content. While blog post length doesn’t matter—it’s more about completing your story than word count—an effective component of the skyscraper technique is publishing more robust content than any other source available. To top it off, research from Pocket suggests some readers love lengthy articles, and search engines also seem to prefer long-form content. Awesome content begins with an introduction that hooks readers within your first 100 words and entices them to read—or at least scan—your entire piece to learn more. Takeaway: Your content introductions should not be fluff, but really entice readers to continue reading. Give away a free download in exchange for an email address after 100 words. Experiment with longer content such as 2,200-word posts or even e-books, videos, and webinars. Back up your claims with research and success stories. There’s an old study called “The Persuasive Effect Of Source Credibility: Tests Of Cognitive Response” (which is a mouthful) that says when you have credible sources, people are less likely to find flaws in your message (and thus, find you credible). And Nielsen Norman Group suggests links are a promise to your readers. When you apply that to your marketing, you can build credibility through content by using facts, data, and success stories while linking to information that proves your points. Takeaway: Link to credible sources that back up your claims. Research your content before you write to know for a fact that what you’re saying is backed by credible resources. Present your own data for a unique angle, like we did with this case study at CoSchedule: How To Make An SEO Content Strategy That Will Improve Your #1–3 Results By 248%. Publish visually-appealing content on beautiful websites. Usability.gov found that having a credible-looking website scored a four out of five on the relative importance scale, which means people really do judge your content and business by the design of your website. To top that off, pages with images typically get 94% more pageviews than those without. Your website and blog design, graphics, videos, and visual content all have a huge impact on your content’s ROI. Awesome content helps your readers understand you’re a credible source of information. Make it worth your time by refreshing your look. Takeaway: Answer questions, organize your content logically, reference credible sources, show your authors’ credentials, provide an archive, keep your content up to date, and focus on your design to build credibility. BONUS! Use these free guides to get started. Plan awesome, consistent content and save time with these free marketing editorial calendar templates and guides. How Will You Save Time While Planning Awesome Content? Thanks so much for reading! If you know someone who could benefit from these tips, I’d really appreciate you sharing this post to help them out. Now get started with your 14-day free trial of CoSchedule. You’re awesome!